This Combo Bounce House Rental is the dry version of our wet combo bounce house. Our Customers love the spacious bounce area that this bounce house provides, as well as the large dual lane inflatable slide. The sidewinder Combo Bounce house boasts in addition to a large bounce area, a basket ball hoop. 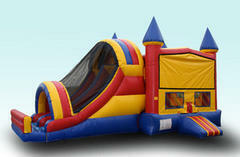 This is a great Inflatable feature that adds excitment as well as an area to have some friendly competition. The kids can bounce, shoot baskets and use one of our two climb areas that lead to the dry inflatable slide. Once they reach the top of the climb area they will enjoy our dual lane inflatable slide. They can race each other to the bottom or simply slide without the wait of those Bounce Houses with a single slide. This Combo bounce house rental has colorful netting that surrounds the bounce area and makes it easy for the supervising adult to monitor the children. The top of this Bounce house is covered to keep the inside cool and keep a light rain off of the bouncers. The Inflatable slide is covered with a black mesh netting that is easy to see through and provides safety and comfort as it keeps the slide nice and cool. This Bounce House rented dry includes a inflatable bumper at the bottom which is interchangable from the pool. As the kids slide down the inflatable slide they come to a soft and cushy stop because of the safety bumper this unit includes. Our professional staff will make sure the bumper is interchanged and properly attached for your party. The 4n1 sidewinder combo bounce house rental also boast the ability to add a theme, when you place this bounce house in the cart you will have the ability to choose from our themed banners You also have the option to leave it plain if you want a neutral theme. The 4n1 Sidewiinder Combo Bounce House is a great addition to any event or backyard party. The set up area for this Bounce house is 40 feet in length x 20 feet in width x 17 feet in height. Be sure to also add Tables and chairs to your event or a dunk tank for that extra thrill. We offer party packages for those looking to pair or group items and we update them monthly. You will need (2) dedicated outlets on a seperate ciruit to power this unit, they must be located within 75 ft of set up area, we carry extension cords but will not run more than 75ft because of fire saftey.